Bill Priestley was born in the north-west London suburb of Highgate on 8 July 1915, the third of four children and the second son of Thomas Gordon Priestley and Muriel, nÃ©e Brown. Named Charles Henry Brian, he acquired the nickname ‘Bill’ while a small child, through his father’s observation that, when wearing his summer sunhat, he looked like the cowboy film star Bronco Bill. When Bill was aged two, the family moved from Highgate to a house built for them at Chorley Wood, then a large village on the edge of the beautiful Chiltern Hills. An extensive garden incorporating a tennis court, cricket pitch and putting green was the venue for socializing. Bill was very close to his father, enjoying his introduction to outdoor activities, and while feeling that his mother favoured his older siblings, he nevertheless remembered her as ‘a lovely person, very gifted’. An accomplished pianist, she would lead singing evenings for the family and friends. From 1922 to 1928 he was a weekly boarder at Beaumont House preparatory school in Heronsgate. In 1929 he succeeded in gaining a full scholarship to Mill Hill School which had been established in 1807 at Hendon, then on London’s north-eastern outskirts, as a grammar school for sons of dissenters from the established church. As a boarder from 1929 to 1934, he learned what he considered a most valuable lesson in how to carry life’s burdens equably. There were taunts about being a ‘brain’, teasing about his rugby ability, a somewhat spartan physical regime, and the school’s ‘stratified but not vicious’ discipline. Always keen on sports, he relished opportunities for honing his skills at cricket and other ball games. Bill spent four years in sixth form, with mathematics as the main subject and physics during the last three years. He acknowledged the brilliance of the senior mathematics master, Herbert Coates, who imparted an appreciation of the power and beauty of mathematics and of method and elegance in science generally. Well prepared for the Cambridge entrance examination, Bill won the open (Baylis) major scholarship to St John’s College in 1934, as well as a supplementary county scholarship and a bursary from Mill Hill. This support was vital if his education was to continue, given the family’s straitened circumstances. Serious business downturns during the great depression forced Bill’s family to sell the Chorley Wood property in 1930 and move to a ‘very ordinary house’ in the same district. Grandfather Priestley showed ‘the kind of man he was’ by blaming Bill’s father Gordon for the business losses and disinheriting him, despite protests from the James family that the downturn was no fault of Gordon’s. This exacerbated Gordon’s declining health and he died in July 1933, leaving his family dependent on support from relatives, including Bill’s maternal grandfather Charles Brown, a leading Baptist minister from 1890 to 1925. Brown was an inspiring minister, and Bill’s deep admiration for his grandfather, not least his ability to engage an audience, was undiminished although attachment to his religious inheritance faded after childhood into agnosticism. At Cambridge he had GI (later Sir Geoffrey) Taylor as his tutor in second year, and was awarded the Adams Memorial Essay Prize for an undergraduate research essay on ‘Tides’. He read for parts 1 and 2 of the Mathematical Tripos (hydrodynamics and thermodynamics), finishing with first-class honours in both parts to gain the BA and the University Mayhew Prize for applied mathematics in 1937. Wishing to remain for a further year ‘for sporting reasons’, he chose economics as his additional subject because it included the study of mathematical statistics. The statistical interest never waned. It flowed over into later leisure pursuits where he analysed poker and bridge sessions and the times taken by fellow club members to complete golf rounds. As a young man, recently graduated from Cambridge with a double first, and with a strong interest in thermodynamics, hydrodynamics and mathematical statistics, Bill Priestley looked around for a job, with a preference for one in commerce or industry (this was 1938). It is not clear why he did not pursue a career in academia since he was bright enough. Maybe the threat of war was a factor, or perhaps there were financial constraints. In April 1939 he joined the Meteorological Office as a Technical Officer and spent over seven years, including all of the war years, with the Office. He was not called up and did not volunteer for military service, since Meteorological Office scientists were considered to be working in a reserved occupation, vital to the war effort. Almost coinciding with his appointment, a lucky accident occurred. Instead of beginning a forecaster training course, he was chosen to join a small research group in micrometeorology led by OG (later Sir Oswald) Sutton at the Chemical Defence Experimental Station at Porton Down in Wiltshire. During his two years at Porton, Priestley came to work closely with two men in particular, FA Pasquill, who during his lifelong career at the Meteorological Office became a world expert on turbulent diffusion, and EL Deacon, who would follow Bill to Melbourne in 1946 and forge his career in CSIRO. At Porton, Priestley concentrated on turbulent diffusion in the lower atmosphere. In mid-1941, he was transferred to Canada with responsibilities for establishing a major joint UK/Canada facility for wartime gas and smoke experiments at Suffield, Alberta. His role was to organize the meteorological section of the complex. During his two years at Suffield, his main scientific contribution was to demonstrate that gas spreading is affected not only by environmental air turbulence, but also by a heavy gas effect; that is, the self-spreading of a dense gas cloud. The prevailing opinion at Porton was that there would be no heavy gas effect. Priestley was somewhat sceptical, and his experiment confirmed that ‘the heavy gas effect could, under certain conditions, be not merely significant but totally dominant’. This work came to be held in high regard, and the validity of the heavy gas effect, when the wind is not too strong, is now universally accepted. Quite suddenly, in October 1943, Bill Priestley was recalled to England to join the newly formed Upper Air Analysis and Forecast Section (the Upper Air Unit) at the Meteorological Office at Dunstable in Bedfordshire, some 50 km north-west of London. The Section’s urgent function was to provide better information in the form of improved forecasts for aircraft navigation, particularly for the increased bombing raids over Western Europe. There, as a forecaster, Priestley collaborated in the development of a more robust technique of upper air analysis using thickness (temperature) patterns to produce isobaric contour charts at successively lower pressure levels (greater heights), and participated in the successful D-Day weather forecast. In September 1944, he was promoted to Senior Meteorologist and Officer-in-Charge of the Synoptics Section of the Upper Air Unit, with responsibility for administration of the Section and all upper air forecasting and research. He had become Deputy Head at 29 years of age. At the end of the war, in 1945, he was promoted to Head of the Section. During his seven years with the Meteorological Office, Priestley gained comprehensive experience of atmospheric systems over a wide range of scales, from the microscale up to global. Later in his career, he looked back on it as two pieces of good fortune: that he had joined the Meteorological Office, and that he had been assigned to the Porton position when it became vacant at just the right time. At Dunstable he met Constance (‘Connie’) Tweedy, a Northumberland woman who was one of the first female meteorological assistants appointed by the Air Ministry. She was the daughter of police constable Henry Tweedy and Sarah, nÃ©e Gair. Connie worked in the Upper Air Unit and became a supervisor of the mainly female staff who decoded and plotted meteorological observations for the analysts. She attained the rank of flight lieutenant by the time she left. Sometime during 1944 she had become engaged to an airman in the Fleet Air Arm who was later killed in action. Shortly afterwards, at a local dance, she met Bill who, it seems, had been aware of Connie’s engagement but knew nothing of its tragic ending. Some six months after their first night out they became engaged, and were married six months later on 26 April 1946. In Australia, CSIR had decided to form a new Section to undertake research in meteorological physics, and to focus on what was perceived to be a major constraint on Australia’s growthâ€”the lack of water. This was in response to a need for more fundamental studies of atmospheric processes, as recognized by FWG (later Sir Frederick White, a member of the CSIR Executive, and EG (Taffy) Bowen, Chief of the CSIR Division of Radiophysics. Establishment of the new Section had the full agreement of HN Warren, Director of the (Australian) Commonwealth Meteorological Bureau. CSIR sought advice from Sir David Brunt (Imperial College, London) as to suitable people for the position of Officer-in-Charge of the new Section. He proposed Priestley, ‘whom I regard as quite the brightest young man who has come into meteorology within the last ten years’. In early 1946, Brunt approached Bill and offered the strongest support for his nomination. Over the next few months Bill had talks with several key visitors to London. Sir David Rivett, then chairman of the CSIR Council, described the organization and its philosophy; Taffy Bowen, who had started a study of radar echoes from clouds that required meteorological support, extolled the CSIR from the viewpoint of a Chief; and HN Warren gave assurances that he fully approved the venture and promised all possible support. Encouraged and persuaded, Priestley applied for the position with CSIR as Officer-in-Charge of the new Section and formally accepted the offer with duty to commence on 23 September 1946. He and Connie departed for Australia on board the passenger ship Dominion Monarch on 24 November, arriving in Melbourne on 23 December 1946 and spending Christmas Day lunch with Fred White’s family in Brighton. The initial question was whether the new section should be based in Melbourne, where the Bureau of Meteorology had its headquarters, or in Sydney,where Bowen’s CSIR Division of Radiophysics was located. Radiophysics included a meteorologically orientated cloud physics group that used instrumented aircraft to conduct measurements in and around clouds, with associated laboratory experiments and cloud seeding investigations. These activities drew on the Division’s expertise in radar observations of cloud liquid water content, and in developing instrumentation for the various measurements required. In early 1947, Priestley spent some weeks in Sydney becoming acquainted with the cloud physics staff and their work. However, in view of the much wider range of meteorological interests within the Bureau of Meteorology, he decided to establish his group in Melbourne. In early 1949 CSIR became independent of the government public service system and was renamed CSIRO. Bill Priestley’s group became the CSIRO Section of Meteorological Physics. For fifteen years after 1945, maybe a little longer, he was at his most prolific, before the heavy responsibilities of Chief of Division and his national and international work slowed him down. What is remarkable about his published work up to 1960’61 is the way that it falls into the two categories summarised below. A detailed account of Bill Priestley’s research can be found in the memoir by Garratt, Webb & McCarthy (see Source below for details). He published 91 scientific articles, published lectures and conference proceedings including four papers in Nature. Large-scale dynamics ‘ From 1945 to 1951 his Upper Air Unit years finally bore fruit, and most of his approximately twenty published articles were concerned with large-scale dynamics. The piece of large-scale work that Priestley considered one of his best concerned the dynamical control of atmospheric pressure, which led to his substantial work on global-scale transport. In these two publications he considered a longstanding paradox in large-scale dynamical meteorology and showed how this could be resolved. Through the atmosphere, generally the wind is close to geostrophic (the geostrophic wind results from the balance of the horizontal pressure gradient force and the Coriolis force), yet the vertically integrated horizontal divergence based on the geostrophic wind approximation gives grossly excessive surface pressure changes and speeds of translation of cyclones and anticyclones. Priestley showed that a closer approximation, using a wind that allowed for trajectory curvature, provided pressure changes comparable to those observed. This was a precursor to his work on global-scale atmospheric transport, where his major focus was on evaluating the meridional (north-south) fluxes of heat, water vapour and angular momentum, at several levels throughout the troposphere. These fluxes could be evaluated directly from the upper-air data recorded at various stations where regular radio-soundings and upper-wind measurements were made. He perceived that knowledge of the meridional fluxes would give a more complete description of global-scale relationships. For the evaluation of these meridional fluxes from measurement, Priestley introduced an important principle. He emphasized that the directly measured upper-wind data should always be used, rather than estimated winds, such as from measured mean gradients or from the pressure pattern, with their likely pitfalls. In hindsight this can be seen as a major breakthrough, and it followed directly from his work on the dynamics of pressure changes. It enabled him to deduce for the first time contributions to the mean meridional transport of both the large-scale quasi-horizontal eddies and the mean meridional circulations. Small-scale heat transfer and convection ‘ From 1951 to 1960, the experience of his Porton work, his tea-time discussions with WC Swinbank in 1945, and the accumulation of observations at the Division’s Edithvale site from 1949 onwards came to fruition. Of approximately thirty articles published, most were concerned with small-scale heat transfer and convection. In reviewing the revolutionary nature of their work, we must first revisit the classical theory of small-scale turbulent transfer in the lower atmosphere, propounded much earlier by GI Taylor. In this, eddies that scale to the height effect the vertical transfer of heat, momentum and mass, in analogy to molecular transfer; an eddy at rest at any level is assumed to have the temperature of the environment at that level. Necessarily, any flux is directed down the gradient. The occurrence of an upward-directed sensible heat flux when the lapse rate of potential temperature is neutral or slightly stable is not predicted by the simple mixing-length theory, so Priestley and Swinbank amended the theory to allow for the fact that a parcel of air (an eddy) not moving vertically at some instant may have a potential temperature differing from that of its environment at the same level, and may subsequently start to rise or sink because of buoyancy. They thus assumed that turbulent transfer would be enhanced in the presence of an upward heat flux, on account of the buoyancy fluctuations. This they called ‘convective turbulence’ to identify it as separate from ‘mechanical turbulence’. A new term was then added to the mixing length equation (or the flux-gradient equation) that could allow for a countergradient heat flux. In this manner Priestley and Swinbank explained how the upward-directed heat flux could be passed from a superadiabatic layer near the ground to levels of several hundreds of metres where the mean lapse rate was zero or even positive. Indeed, Priestley’s team’s observations at the field site near Edithvale did later confirm a strong influence of this kind. Eventually, their work led to a joint paper published in Proceedings of the Royal Society in 1947 that challenged the established views on vertical turbulent heat transfer and was the trigger for the turbulence work later taken up in CSIRO in Australia. This was one of the most productive papers of their two careers, at least as measured by the extent of subsequent work that ultimately stemmed from it. Priestley in particular published several articles over the next fifteen years that related the temperature fluctuations in convective conditions to the vertical heat flux. Another result of the 1947 paper lay dormant until 1966. In explaining the puzzle of counter gradient heat transfer in convective conditions, Deardorff (1966) emphasized the importance of the concept developed by Priestley and Swinbank of non-local mixing above the surface layer. Today, non-local mixing is known to extend to the whole of the convective boundary layer, and also to occur in vegetation canopies and other complex flows near the ground. It has had numerous applications, including turbulence parametrizations in numerical weather prediction and pollution transport models. Thus, from the outset, the main research effort at Aspendale was focused on the unstable (that is, daytime) side of neutral conditions, since this was when the fluxes were largest and geophysically most important. The expectation that the eddy transfer coefficient (ratio of vertical flux to vertical gradient) for heat would exceed that for momentum was confirmed against the opposite prediction of classical theory. However, Priestley and his small team were surprised, and their overseas colleagues at first incredulous, at the closeness to neutral at which this and associated buoyancy effects began to appear. the fact that parcel convection in a constant lapse rate would not have just the two modes of infinite rise or simple ascent to an equilibrium level, but a third ‘ namely penetration of that level and subsequent damped oscillations. Other major contributions are his work with FK Ball in 1954-56 on the formal treatment of vertical plume rise through an ambient temperature gradient, and his own work on a plume bent over by the wind. Small-scale turbulent transfer and evaporation ‘ Bill Priestley’s involvement at the UK Meteorological Office with colleagues such as Pasquill, Sheppard, Sutton, Deacon and Swinbank (all micrometeorologists) was key to his life-long interest in the small-scale vertical transfer of momentum, heat and water vapour by turbulence in the atmospheric boundary layer. Indeed, this set the scene for a major component of the CSIRO Division’s work throughout the 1950s and 1960s. In addition to his own research on large-scale dynamics and small-scale convection, a third main interest of his focused on the natural water cycle in the atmosphere, specifically evaporation from the land, and on Australian rainfall climatology. Both were intimately tied to his Division’s work but it is probable that Priestley himself would never have identified this corpus of work as amongst his best. He certainly never did in any of his interviews, nor in his later reminiscences on the success or otherwise of the Division’s research. At the start, the objective of Priestley’s Section was to carry out basic research in the deliberate, unhurried and English scientific tradition. Permanent accommodation for the Section’s laboratories was required as activities and staff expanded. At Priestley’s suggestion, CSIRO purchased a very suitable site at Aspendale, a bayside suburb in south-east Melbourne. The Section moved from Highett to Aspendale in November 1953, and so, after an unsettled first eight years, the Meteorological Physics Section was finally in its permanent quarters. In 1955, it became the Division of Meteorological Physics, with Bill Priestley as its first Chief. Throughout these early years, both as Section Head and then Chief, Priestley found a permanent counsellor and supporter in Sir Frederick White, then a member of the CSIR Executive and after 1949 Chief Executive Officer of CSIRO. Indeed, in 1959, after White became Chairman of CSIRO, in pushing for increased membership of the CSIRO Executive he invited Priestley to fill one of the vacancies. Bill, still working to achieve more for Australian meteorology and being unsure of his ability to make solid judgments across the whole front of applied science, declined. The initial and continuing success of the Division in its early years was surely due to Priestley’s leadership and scientific qualities, and to the then CSIRO policy of appointing Chiefs and then allowing them to structure their Divisions more or less as they wished. Such liberal lines of structure gave plenty of freedom to the Chiefs and to individual scientists. Therein lay one of Bill Priestley’s main strengthsâ€”identifying and appointing the best persons for jobs, then allowing them to get on with the work. His philosophy on the success of research scientists, leadership and research institutions was expounded succinctly in a confidential document, later declassified. He observed that the first principle determining the quality of a research institute is that the people are more important than the structure. This is particularly true in research. The second principle is that, while the best people will do good research in a poor structure, by and large it will not hold them. Attainment of excellence in an institutional sense may require more than a decade of resolve and effort. Of the people, the leadership is paramount. The prime responsibility of the leader is to generate and perpetuate a favourable atmosphere, and he must demand the best from his staff and know when he is getting it. Around 1964, his old colleague OG Sutton, Director-General of the UK Meteorological Office, invited him to spend a week at his home while Priestley was visiting the UK. In fact, Sutton was due to retire and looked to Priestley to succeed him, introducing Bill to two members of the Meteorological Committee over lunch. Next year, Priestley received a letter from the Permanent Under-Secretary at the Ministry of Defence, inviting him to a meeting in England with a view to his being considered as a candidate for Director-General. Another candidate on the short list was BJ (later Sir John) Mason. Mason and Priestley conferred over lunch and Priestley subsequently withdrew, the chief reason being that he and his family were happy in Australia. 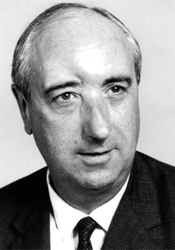 In 1965, Mason became Director-General of the UK Meteorological Office, and Bill Priestley is quoted later as saying that he thought Mason ‘did a superb job as Director-General’. Through the 1960s, Priestley’s views on the numerical modelling of the atmosphere began to change, through the influence of both his Australian colleagues and his international connections. The USA in particular was leading the field in its development, and Priestley was perceptive enough to see its potential in both numerical weather prediction and climate modelling, but realized that CSIRO lacked the resources to make progress in this field by itself. The need to involve and to encourage the Bureau of Meteorology in numerical modelling was apparent, because they had both the necessary skilled meteorologists and the modern computers that were essential. Priestley worked with the Director of the Bureau of Meteorology,WJ Gibbs, to establish a new, joint research centre the Commonwealth Meteorological Research Centre (CMRC) which became operational in 1969. In parallel with the growth in numerical modelling of the atmosphere, there was a growing international emphasis on atmospheric composition and chemistry. Post-war industrial development had led to the deterioration of air quality in cities around the world and significant research efforts directed at understanding these changes followed. Priestley supported the growth of studies in air pollution and, in particular, engagement in the La Trobe Valley Air Shed Study. Almost inevitably the work on regional changes to atmospheric chemistry led to questions about the potential for human influences on the composition of the global atmosphere. He both encouraged and fostered the redirection of Divisional efforts towards what was then an emerging field ‘ the possibility of global warming related to increased concentrations of gases such as carbon dioxide. He oversaw the emergence of an atmospheric chemistry programme directed at the new topic of global biogeochemical cycles. There followed a programme of high-precision atmospheric carbon dioxide measurements that would lead Graeme Pearman, an appointee of Priestley’s in 1971, to become Australia’s pre-eminent expert and spokesman on many aspects of climate change and global warming. In 1971-73 a series of events determined the remainder of Priestley’s career in CSIRO. In 1971, the Cloud Physics Section of the Division of Radiophysics was briefly moved into his jurisdiction when JP Wild became that Division’s new Chief. Later that year, Priestley’s Division was renamed the Division of Atmospheric Physics, with its work now covering a wide range of atmospheric physical processes. In 1972, CSIRO created a new Division of Environmental Mechanics with John Philip as Chief. This announcement, discovered one morning ‘in a press release’, was a bombshell to Priestley since its terms of reference were close to what his own Division had been doing for twenty five years. A hurried phone call to Canberra, and a visit soon after by the CSIRO Chairman, JR (later Sir Robert Price, led to the decision that Priestley should oversee both Divisions. He then insisted that such an arrangement should be formalized and should include the CSIRO component in the CMRC. It was finally decided by CSIRO to create the Environmental Physics Research Laboratories (EPRL), with Priestley as Chairman, to comprise the Divisions of Atmospheric Physics, Cloud Physics (which had become a separate Division in 1972) and the new Division of Environmental Mechanics, together with the CSIRO component of CMRC. As a consequence, the position as Chief of the Division of Atmospheric Physics was advertised and in early 1973 Priestley retired to be succeeded by Brian Tucker. Bill continued in CSIRO as Chairman of EPRL until his final retirement, being consulted by both the Executive and the individual Chiefs, and well pleased to have shed a large management role. He retired for health reasons from CSIRO in 1977, and the EPRL grouping was discontinued. By the 1960s, Bill Priestley was heavily involved internationally. He was one of several eminent scientists entrusted with formulating and planning the WMO Global Atmospheric Research Programme (GARP), first as a member of the WMO Advisory Committee (from 1963 to 1969, becoming chairman in his penultimate year) and subsequently as one of the founder members of the Joint Organising Committee for GARP. He also served on three commissions of the International Association of Meteorology and Atmospheric Physics. During this period, he first put forward the idea of a project to gather historical sea-surface temperature data, a project that eventually came to fruition. In 1967, Priestley was appointed with eleven others as a founder member of the Joint WMO/ICSU (International Council of Scientific Unionsâ€”now the International Council of Science) Organising Committee for GARP, and served on it for four years. Incidentally, he was one of only two members from the Southern Hemisphere on both the WMO Advisory Committee and the Joint Organising Committee for GARP. He retired from all WMO responsibilities in 1977. Following Priestley’s retirement from CSIRO and all WMO activities in 1977, he was offered and accepted a part-time professorship at Monash University in Melbourne. Giving a course of lectures each year was a new experience and this occupied his time for four years. In 1981, when he had reached the age of 65 and, according to the prevailing rules, could no longer be paid for his services, he resigned. In April 1981, he chaired an Academy symposium on the lower atmosphere at which some of the first findings of the Cape Grim observatory were reported. In 1982, he gave an invited lecture entitled ‘Commentary on five decades of meteorology: 1940-1990’. Professionally he was close to calling it a day, but two final tasks awaited him. At about this time, the new Director of Meteorology, JW Zillman, asked Priestley to undertake a confidential critical review of research in the Bureau of Meteorology. He gladly accepted, and his final report was submitted to the Director in August 1982; it was declassified in 1992. In due course, many of his recommendations were acted upon when the Bureau’s new Research Centre was established in 1985. He used this report, amongst other things, to set out long-held thoughts on the factors that underpin a successful leader and a successful research scientist. He also summarized his thinking on past CSIRO-Bureau research policy and relations, going back as far as his early experiences with HN Warren. During 1982, Priestley was also invited to replace WJ Gibbs as part-time chairman of the Latrobe Valley Airshed Study, a major Victorian state government project to assess the environmental limits to power-station development. Such was the enormous size of the Study that, after two years, Priestley informed the Steering Committee that a full-time director was required, but his recommendation was rejected. With an increasing workload and his own part-time salary falling behind this and inflation, he resigned in mid-1985. From the early 1990s, he was rarely sighted in public, as ill health took its toll. Whilst still active, he continued to play golf, bridge and poker. At golf he had a single figure handicap in his earlier years and had been a long-term member of the Metropolitan Golf Club in south-east Melbourne’s sand belt. He also enjoyed watching sport on television: to quote from his interview, ‘the slower ones can provide the best watching. In my experience as a research leader, the same was sometimes true of scientists’. He loved reading and with his wife regularly joined friends at the theatre and at concerts. He enjoyed setting himself the goal of listening to all his music records and tapes, which took him about six months. Then he was ready to start again. Bill Priestley was possessed of a dignified manner, made measured pronouncements and had obvious outstanding scientific ability ‘ assessments of him that were as valid in 1940 as in 1980. He could be autocratic, sometimes emphatically so during his time as Chief; One story relates to pre-Christmas drinks in the Division where it was traditional for Priestley to join staff and celebrate the year’s achievements. But on one occasion he proceeded to lambast scientists for their poor showing that year, and stormed out leaving his audience to reflect on his words. Such instances tended to mask a reserved, private individual who was intensely proud of his English background but equally proud of his contribution to Australia. After several years of declining health, Bill Priestley died on 18 May 1998, seven weeks before he turned 83. Behind his dignity and reserve, Bill possessed a delightful sense of humour, rarely seen other than by family and close friends. Bill Priestley received many honours and awards over his lifetime. He was a man of great academic ability, integrity and leadership skills, a beautiful writer of the English language who made a notable contribution to the science of meteorology. Few men of science go to their final resting place with their name attached to two scientific constants or lawsâ€”the Priestley constant in free convection and the Priestley-Taylor ratio for evaporation in well-watered landscapes. In 1983, the Australian Meteorological and Oceanographic Society introduced as its most prestigious award, the Priestley Medal, awarded biennially in recognition of excellence in research. In 1995, the Division of Atmospheric Research named its main lecture theatre, the Priestley lecture theatre, and instigated an annual Priestley Lecture to be held there. The inaugural lecture in October 1995 was given by AM Yaglom on a topic close to Bill’s heart, ‘Heat transfer laws in free convection’. Unfortunately, Bill was not well enough to attend. Preceding the inaugural lecture a painting of Priestley by Frances (Fay) Philip (wife of ex-CSIRO Chief JR Philip) was unveiled and hung in the lecture theatre. It reveals the tall, angular Bill Priestley, seated and in pensive mood, late in his career. 1976 Flinders Medal, the highest award given by the Australian Academy of Science to a physical scientist. 1974 Rossby Research Medal, the American Meteorological Society’s highest honour ‘ for his fundamental contributions to the understanding of turbulent processes and the links between small-scale and large-scale dynamics in the atmosphere. 1967 Symons Memorial Gold Medal, the senior award of the Royal Meteorological Society, for distinguished contributions to meteorology. 1956 David Syme Research Prize, University of Melbourne’s for his early work on convection in turbulence. 1953 DSc, University of Cambridge based solely on the two dozen or so papers published in the years after he left Cambridge. 1949 Buchan Prize of the Royal Meteorological Society ‘ for his series of articles in the Society’s Quarterly Journal, 1945’49.